A report in The Guardian has highlighted the violent confrontations that are occurring in Tibet, as people scramble to collect “Himalayan Viagra”. 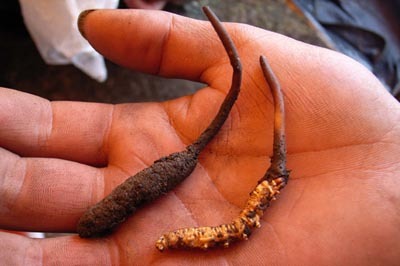 The official name for this aphrodisiac is cordyceps sinensis, or the caterpillar fungus (Tib: Yartsa Gunbu or “Winter Insect and Summer Grass”), and it grows on the mountains of Tibet and China. Aside from enhancing libido it is said to help treat cancer, and have other health properties. It was previously thrust into the media limelight when China’s Olympic coach hailed it as the reason for the success of three female runners, in the 1993 Olympics. Because the fungus is so highly valued in the region, many locals are taking to the mountainsides to hunt for it. Some are working 12 hour days to maximise their takings. Yet as more and more people pick the fungus, competition is sometimes turning nasty. In 2007 violent confrontations with guns and knives broke out, The Guardian reports. Eight people were shot to death, and fifty people were wounded. There are fears that if this intense gold rush for the fungus continues, clashes such as these could occur again. There are also concerns that the mountains will soon be bare of the fungus. Herbal Viagra: is it safe? Some herbal remedies may be effective in treating impotence. One example is ‘Horny Goat Weed’, a Japanese herb deemed so similar to Viagra, that its existence has stopped Viagra from being fully patented. Another treatment that seems to work well is Viapro, which is made from various ingredients, including the maca root, from the mountains of Peru. It also includes the velvet from deer antlers. While some herbal treatments may be effective, it is important to remember that any herbal Viagra will not have undergone rigorous testing. A regulated erectile dysfunction drug will have. Furthermore, herbal Viagra is not specifically designed to treat impotence. These are simply natural substances that have been found to have an aphrodisiac effect.